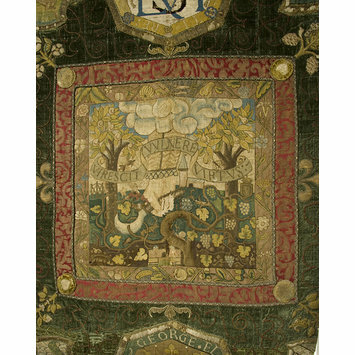 Now on permanent loan to Oxburgh Hall, in Norfolk, these embroideries were made between 1569 and about 1585. They are the work of Mary Queen of Scots, during her imprisonment in England and Elizabeth (Bess) Talbot, Countess of Shrewsbury. Bess's husband George Talbot, Earl of Shrewsbury was responsible for Mary and she stayed at one or other of the Shrewsbury estates. Embroidery was a form of therapy and communication for Mary, as well as a conventional occupation for wealthy and elite women. Most of the motifs depicted were copied from the wood-cut illustrations of emblem books and natural histories by well-known authors such as Claud Paradin, Conrad Gessner, Pierre Belon. These often represented sentiments and morals from classical literature and contemporary folklore, and were chosen by Mary to express her most private thoughts at a time when all her written correspondence was being monitored by her captors. This work is known as the 'Marian' hanging, because the embroideries relate most directly to her. It comprises individual panels of canvas work (stitching over the threads of a coarsely woven linen) in coloured silks, silver and silver-gilt thread, mounted on green velvet. The central panel bears the inscription VIRESCIT VULNERE VIRTUS (Virtue flourishes by wounding) with the royal arms of Scotland and Mary's monogram, the letters MA superimposed on the Greek letter phi. A version of this panel was sent to the Earl of Norfolk who was planning to marry Mary and supplant Queen Elizabeth. There are eight octagonal and 28 smaller, cross-shaped panels depicting various plants, birds, animals and fish, 18 of which bear Mary's monogram. Not all the panels were embroidered by her, as household accounts show that she had professional embroiderers as part of her retinue. The existing 'hangings' are not the original arrangement of the embroidery. They may have originally served as cushion covers or smaller hangings; Mary frequently sent embroideries as gifts to friends and supporters, as well as Queen Elizabeth. The embroideries were given to Ann Dacre, Countess of Arundel, daughter-in-law of the Duke of Norfolk who was executed in 1574 for his plot against Queen Elizabeth. It is thought that the current arrangement of wall hanging, two bed curtains and valance was put together in the late 17th century by Ann Dacre's daughter-in-law, Alathea Talbot, granddaughter of Bess, Countess of Shrewsbury. The hangings made their way through descendants of the Arundels to Cowdray Park. In 1761, the hangings came to Oxburgh Hall. They were purchased by the National Art Collections Fund in 1955. Unable to give them directly to the National Trust, the NACF donated the hangings to the V&A Museum, on condition they remain at Oxburgh. Embroidered hanging of green velvet with an all-over interlaced pattern worked in couched cord with red silk and silver-gilt thread. To the velvet are applied 37 panels of various shapes and sizes embroidered in coloured silks and silver-gilt thread, mainly in cross and tent stitches. 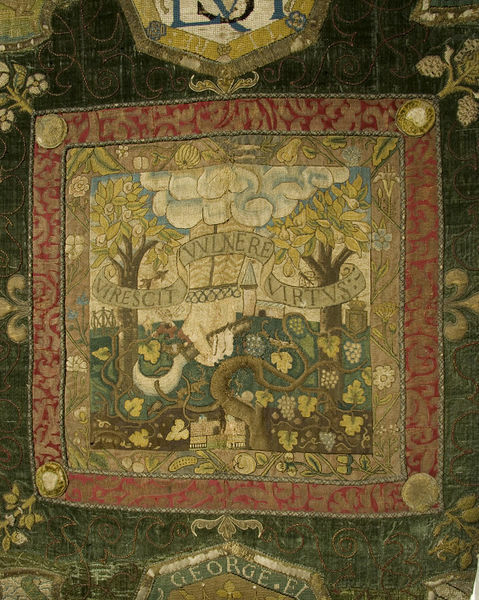 In the centre is a large square panel of needlework with a border of red and yellow woven silk and an inner embroidered border of flowers and fruit; a hand holding a sickle descends from clouds and prunes the branch of a vine; inscription 'VIRESCIT VULNERE VIRTUS' (Virtue flourishes by a wound) with Royal Arms of Scotland and the monogram of Mary Queen of Scots. Eight octagonal panels of needlework contain monograms of Mary Stuart, Mary Elizabeth, and George Elizabeth Shrewsbury and embroidered emblems with mottoes. There are 28 smaller cross-shaped embroidered panels of birds, animals and fish, each with its name in a scroll design it. Lined with green silk.